Agnolotti is a kind of ravioli made with small pieces of flattened pasta dough, folded over with a roast beef meat and vegetable stuffing. 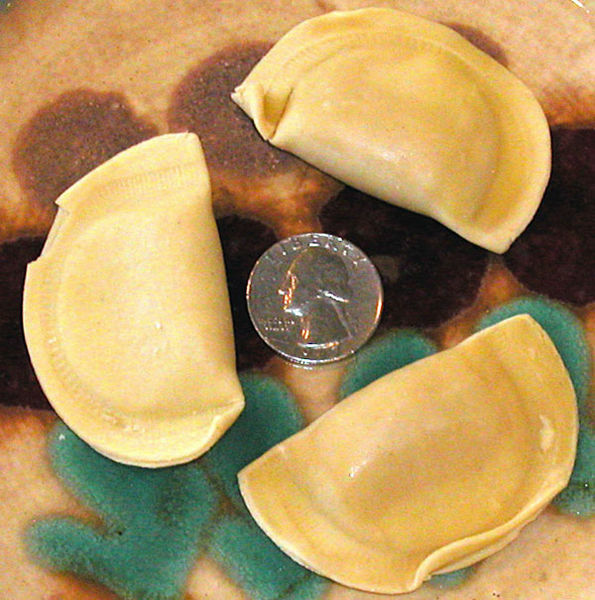 Traditionally agnolotti are of a square shape, side of about 1 inch. However, they can also be semicircular. Left: Uncooked semicircular agnolotti pasta. Agnolotti are prepared by immersion in boiling water. Typically, they are dressed in a beef broth and a little melted butter or in a fresh sage and melted butter sauce, as a complex sauce would detract from the flavours in the agnolotti pockets. In both cases topped with Parmigiano Reggiano cheese but no cheese resides in the agnolotti.